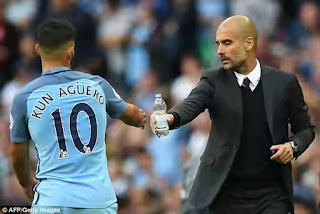 Questions have started to surround the future of Manchester City striker, Sergio Aguero after a rumored fallout with his new manager, Pep Guardiola. Aguero came on as a substitute as Manchester City lost heavily to Barcelona 4-0 in their Champions League encounter on Wednesday night. The rumor mill has been agog with a reported fallout between Aguero and Pep. Pep has had no qualms in doing away with some of City’s biggest players, having allowed Joe Hart to leave on loan and leaving Yaya Toure out of the first team altogether. Ahead of City’s clash with Southampton on Saturday, Guardiola dismissed reports of a rift with the striker, Aguero.